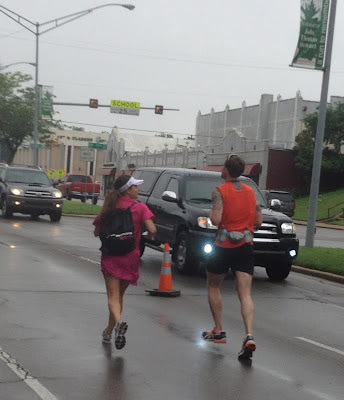 Well, what can I say about my experience at the Oklahoma City Memorial Marathon? A lot. Probably too much. I'll start with this: The race ate my lunch. It hurt, but I finished. And I would do it again. moment when the city and nation started to heal. I am glad I took some extra time off to properly check out the city. I've passed through various parts of Oklahoma over the years; but besides a one-night stay in Lawton back in high school, this past weekend was the first time I spent appreciable time in the Sooner State. My time in Oklahoma City was terrific. The people I met — locals, race participants and race volunteers — were great. Despite some road repairs and road closings (for the race, an arts fest and the Thunder/Mavs playoffs series), navigating the downtown area was easy. Visiting the memorial and museum was essential for me. As I mentioned last week, the tragedy in 1995 led to a lasting musical moment in my life. Going to the memorial was a powerful experience. It's hard not getting emotional when you see the 168 chairs representing each life lost, the 100-year-old Survivor Tree and the Survivors' Wall. It's worth a weekend trip to OKC just to visit this site. Sundry facts: 75 percent of the memorial foundation's annual funding comes from the race; non-native trees surrounding the memorial/museum represent non-Oklahomans who helped in the recovery; and the memorial's primary designers are University of Texas at Austin graduates. The pine trees surrounding the 168 chairs mark the perimeter of the Federal Building. Yes, yes it does. Portion of an inscription at the Survivor Tree. Probably the best view from an urban parking garage I've ever seen. This repurposed warehouse district has a grip of restaurants, a minor league ballpark, bars and music venues and is exactly what Dallas' West End should be (vibrant, fun and safe). Sure, it would be difficult to "fix" the West End; but after seeing Bricktown, I think it's worth pursuing (replace the generic crap and the crime with local flavor and a variety of dining/entertainment options that appeal to families, professionals and tourists). Of the Bricktown spots I hit up, I highly recommend Bricktown Brewery (Bricktown Brown is a very good ale) Zio's Italian Kitchen and even the Fuzzy's Taco Shop franchise that recently sprouted in Lower Bricktown. That segment even has a mini-rivercreekwalk. Kinda cool. Probably the nicest alley named after an indie rock band in the contiguous United States. Scenic view of Lake Hefner, near mile 14 of the marathon: I scouted the course the day before the race so I wouldn't go into it completely blind. The biggest thing I noticed? Hills! Hills! And more hills! 168 of them on the course. I'd be lying if I said I started the race feeling super confident. My bout with exhaustion from overtraining concerned me. The humid climate and 60 percent chance of thunderstorms on race day also weren't reassuring. But all that passed when I met up with frunners — TPG, Mama C, Drum, Team K and Marci — some whom I had the pleasure of meeting for the first time. It was calming to be around fun folks who have raced much more than I have. I was far less anxious in the corral. The 168 seconds of silence also were sobering and calming. The first 12 miles were fine. Sure, the hills were challenging, but I was comfortable running in between the 4:20 and 4:30 pace groups. Even the 30 minutes of rain was a nice, cooling treat. But then my hamstring started whispering around the half-way point. I kept on trucking. It got a little louder, so I walked for the first time, briefly around mile 14. By mile 16, I was in trouble. The pain wasn't unbearable, but uncomfortable. My energy was high ... but so were the hills in front of me. Slight rises in elevation meant I was walking. A lot. I tried to slowly run up an incline, but I just couldn't manage. I walked at least half of miles 17-22. I received much-appreciated encouragement from Drum, who was waiting to pace Marci, somewhere around mile 19 or so. Thankful to see more friendly faces and hear words of encouragement at mile 23, I managed to run more often than walk for the final 3 miles. I even picked up my pace in the final half mile. I finished in 4:58, about 20 minutes slower than my first marathon. Heading into the race, I would have told you that a near-5 hour finish would not be a good time. But besides the race really wasn't about having a "good time." It was about running to remember. And I did plenty of that while I walked. And I wouldn't trade it for the world. As I type this, I'm sore and tired. I'm also appreciative that I could — and did — run a marathon yesterday. I'm appreciative of those who helped get me to the start and finish lines. But more than anything, I'm especially impressed with the people of Oklahoma City. They have united after a horrific event. There is strength in numbers. 27,000 participated yesterday. It was an honor to be among them. After recovery, I plan on spending more time on my bikes. There are some MTB trails I have my eye on, and country roads are a callin'. Running-wise, the only event I plan to participate in is the Lovejoy Country Run. It will be my first 5K, so that means guaranteed PR! Trust me, I will be in no hurry out there. Warm weather and I don't get along (I sweat like a fat man in a sauna), so anything more than a half marathon is out of the question. I'll still log some miles at White Rock and Northshore, too. Ultimately I will run another full marathon. I have good races in these legs! As I continue to improve my training, I am certain I will accrue more medals, visit more cities and continue to meet impressive people. Congratulations on another marathon! You toughed it out despite rough weather and injury. FIGJAM! OK, first of all, how have I missed your blog?? and secondly, CONGRATS!! It was a rough day and you powered through! They do put on a great race, don't they? I always will recommend this one as a "must" for any marathoner or half-marathoner. FIGJAM!!!! Great job out there battling the hills, weather, and hamstring!!! Love the blog and loved getting to meet you!